Hello everyone!! For this next week, I'm turning the blog over to my friend and Dream Team member Danielle Craver. She's the brains behind all the crests you've seen for the Vanguard, Ethereals, Outlanders, Ecclesiastics, and Voltons. Her designs ends up gracing the covers of all three novels, and she's here to share with you the secret meanings behind each one! Today, she's revealing all the research that went into the Vanguard crest, which graces the cover of The Prophecy! Hi Everyone! 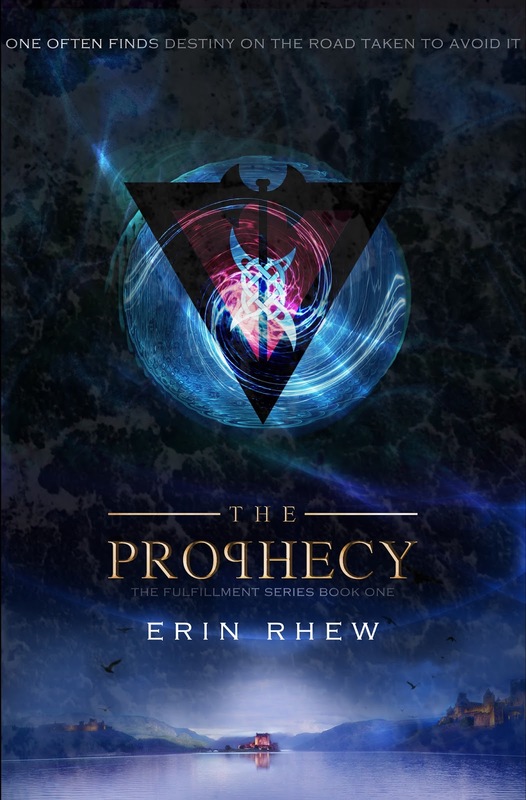 My name is Danielle, and Erin has asked me to write a few blogs to give you the background on the crests featured in the world of The Prophecy. Some of you may have looked at the crests and thought about the crest designs, symbols, colors, AND.....why did you even decide to make the crests? Well, I am here to answer all your questions (well most of them...there still may be a few surprises left open). Some you may have figured out while others may surprise you and I may just reveal a surprise or two. Now that I have your attention, we will start with how the idea of crests even came about. You may wonder how the crests really came into being. Erin and I were on a run. I have to laugh at that because it seems that much of Erin's ideas and discoveries were either over queso or on a run. We were talking about The Prophecy well before publication time, discussing the male characters in the book. We found that Wil and Nash were such great, but uniquely different characters that we felt the readers may have split loyalties. Deciding that the whole “Team Guy 1” and “Team Guy 2” was so overdone, we wanted to come up with a way for the readers to show their loyalty and back their guy. The idea of crests was born. At first I think we were joking about it, but I went home and started researching (have I mentioned that I LOVE researching?) and images started to come to life. I thought that we would need crests for each kingdom and faction so I started sketching. One night, Erin and I (and a few other friends) met for frozen yogurt, and I showed her a few of my sketch ideas. The Ecclesiastic one was a home run right from the start, and hence, it became the first crest she released. If you wanted to know more about the Ecclesiastic crest, well you will just have to wait! First up is Layla's home kingdom- Vanguard! Just as The Prophecy opens in Vanguard, we too will begin with Layla's own crest- the Vanguards! For centuries they have been at war with their sworn enemies, the Ethereals. Who doesn't love the Vanguards? What is not to love- the Vanguards are endowed with supernatural strength and a cunningness making them almost unstoppable on the battlefield. They are typically very loyal, passionate to their cause, protective, and pretty stubborn. More Vanguard traits include a certain amount of swagger, a bit of sarcasm, dark hair, dreamy eyes... (yes Samson, I am referring to you <3 ) But I digress... Vanguards possess so many qualities we love in our heroes and heroines. 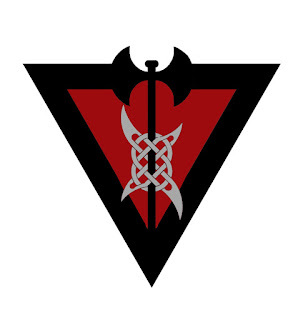 The main parts of the Vanguard crest are the elemental symbol for water, a celtic symbol for strength and a labrys. All five of the crests are based on the elemental symbols for earth, air, fire, water and spirit (shown below). As all things are born of these symbols, I saw it fitting to begin each crest with one. 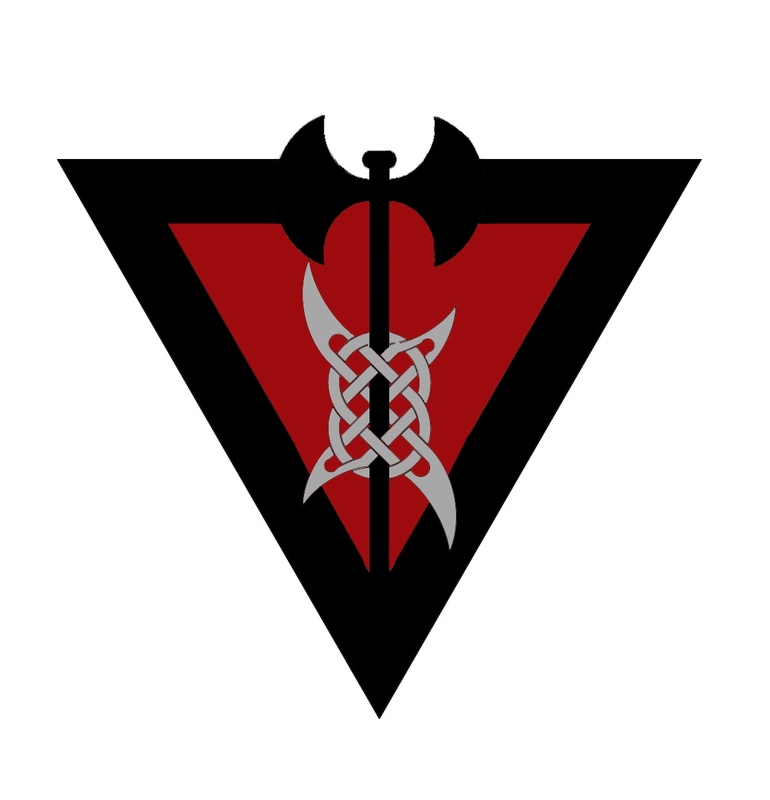 The Vanguards have been given the water symbol which... will be revealed in one of my later blogs. Sorry, you will just have to wait! symbols and found one that I love. A labrys is a double-sided axe and shows up frequently in symbolic history. This type of weapon itself can look rather menacing, especially when Nash picks up a fallen Vanguard's battle axe and deftly wields it along with his own sword! Symbolically however, the labrys is often associated with female divinities. As our heroine is possibly a mythical being herself, it fits. 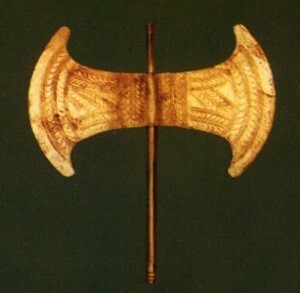 The symbolism is not left just in the past; today the axe is a symbol of women's strength and self-sufficiency. The color red is completely fitting for the Vanguards as they are a passionate bunch. Red is also associated with energy, war, danger, power, and is overall a very emotional color. That about covers the Vanguard crest. I would love to hear if you spotted these parts before in the crest or if you see something else within them. Maybe take a guess at why the water symbol was used? Next up will be the Vanguard's sworn enemies.....The Ethereals! (Part of which happens to be featured on the cover of The Fulfillment- available on October15th).